Regardless of the current market turmoil, EOS continues to court attention following their Block Producer voting squabbles. Still, it is not one of the biggest loser because day to day gains and losses tracker indicates that IOTA and Tron are the leaders in the top 10. From the daily chart, Tron is down 22 percent in the last 24 hours meaning it is now down from 9 and perched at position 10. Just to quantify, EOS is down 16 percent and helping propagate the crypto market loss of more than $20 billion in three days. Fact is, EOS blockchain is than 72 hours old and validation and other protocols whats not have been done but something that was expected to be a breeze is quickly turning into a trust issue. Apparently, some EOS coin holders don’t want to vote because voting entails submitting private keys. Because of this, a mere three percent of coin holders have already voted for their Block Producer of Choice and that’s an under-performance for sure. EOS dictates a minimum 15 percent of EOS holders to vote and stake their coins for the network to be valid and to allow normal functioning. Like yesterday’s trade plan, you should sell especially if sentiment continue to be negative as it is. The longer it takes for voting to take place, the more EOS would continue with its slide. $10 remains a key support line and today we might see moves below that it in line with June 10 strong slide. Our ultimate sell targets with ideal stops at $14 is at $7. According to Charlie Lee of Litecoin, businesses around the world are racing to integrate LTC as one of their payment method. Of course, this is what coin holders want to see now that prices are struggling to resist these fierce bears. Already Litecoin is down 12 percent in the last 24 hours and what that means is that sellers are now trading below our main support line at $110. Because of this, I recommend selling at every high or at current prices with stops at $110 with targets at $90 and later $80. Our triggers were at 25 cents and with yesterday’s bear confirmation, Stellar Lumens is now trading at around 23 cents. This means selling according to our trade plan and shorting at every highs with targets at 18 cents, our key support line in the daily chart. Even though the coins are down, none other is experiencing losses as Tron. In the last 24 hours alone, Tron lost more than 22 percent testing 4 cents and dropping to position 10. As it is, this is a straight sell from a plain view despite rejection of prices below 5 cents if you check out yesterday’s long lower wick. In my view, trading with the trend and shorting at every high with targets at 2.5 cents or Q1 lows would be a good strategy. This coin is definitely a long term buy especially now Volkswagen has demonstrated their concept with MaaS where they are partnering with IOTA. Of course, this is not their first partnership and we expect more to follow through and demonstrate what is in store with M2M and IoT in the days to come. Perhaps this may spur buyers back into the market and help decouple IOTA from BTC influence. From the chart, sellers are in charge and now that prices are trending below $1.5, it’s likely that we may see prices testing $1. As such, I recommend selling at every high with ideal stops above $1.5 at the time being just like our trade suggestion yesterday. 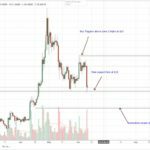 The post EOS, Tron, Litecoin, Stellar Lumens and IOTA Technical Analysis (June 12, 2018) appeared first on NewsBTC. Crypto Regulation is Necessary, But is Korea on Right Track?